Damaged Portland detective Archie Sheridan spent ten years tracking Gretchen Lowell, a beautiful serial killer, but in the end she was the one who caught him. Two years ago, Gretchen kidnapped Archie and tortured him for ten days, but instead of killing him, she mysteriously decided to let him go. She turned herself in, and now Gretchen has been locked away for the rest of her life, while Archie is in a prison of another kind---addicted to pain pills, unable to return to his old life, powerless to get those ten horrific days off his mind. Archie's a different person, his estranged wife says, and he knows she's right. He continues to visit Gretchen in prison once a week, saying that only he can get her to confess as to the whereabouts of more of her victims, but even he knows the truth---he can't stay away. Chelsea Cain is the "New York Times" bestselling author of "The Night Season, Evil at Heart," and "Sweetheart." Both "Heartsick "and "Sweetheart" were listed in Stephen King's Top Ten Books of the Year in "Entertainment Weekly." Chelsea lived the first few years of her life on an Iowa commune, then grew up in Bellingham, WA, where the infamous Green River killer was "the boogieman" of her youth. The true story of the Green River killer's capture was the inspiration for the story of Gretchen and Archie. Cain lives in Portland with her husband and daughter. "Heartsick has it all: a tortured cop, a fearless and quirky heroine, and what may be the creepiest serial killer ever created. This is an addictive read!" "With Gretchen Lowell, Chelsea Cain gives us the most compelling, most original serial killer since Hannibal Lecter." 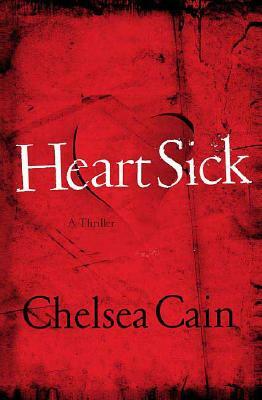 "Chelsea Cain's novel is completely entrancing and totally original---what a read. Between the humanity of Portland cop Archie Sheridan and the chilling and twisted design of his beautiful nemesis, Gretchen Lowell, Heartsick is utterly unforgettable. Cain is a wonderful---and terrifying---storyteller."